Nvidia essentially killed off 3- and 4-way SLI multi-GPU support with its GeForce GTX 1080 and 1070, but AMD's keeping CrossFire support alive and kicking. Ish. Things weren’t looking good for multi-GPU enthusiasts around the time of the GeForce GTX 1080’s launch. Extreme 3- and 4-way SLI setups were always a slim minority, but with such a move, Nvidia is ready to all but kill them completely going forward. At least, that's the case for DirectX 11 games—a.k.a the overwhelming majority of games still being released today. DirectX 12 and Vulkan are still in their relative infancy, so gaming with three or four GTX 10-series cards at once is but a pipe dream for the foreseeable future. Naturally, we wondered if AMD would go the same route with the Radeon RX 480, the first graphics card based on its new 14nm Polaris GPU. So it looks like CrossFire support for 3- and 4-way setups will keep on trucking with Polaris. That's not totally surprising, since AMD has mentioned rigs with multiple RX 480s as an affordable alternative to the pricey, powerful GTX 1080. 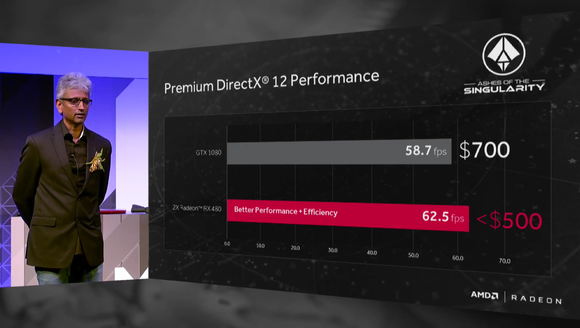 The story behind the story: AMD’s statement hints at a greater point, though: 3- and 4-way multi-GPU setups usually scale horribly, stutter frequently, and aren’t really worth the money. They’re best used for topping extreme benchmark leaderboards rather than actual gameplay—and Nvidia actually plans to provide in-driver support for that type of use with its GTX 10-series cards. (So close, yet so far.) Nevertheless, the crotchety enthusiast in me is still smiling inside, now that I know 3- and 4-way CrossFire setups will still work just fine—or at least as fine as ever. Sometimes it's fun to throw as much firepower as possible at things just because you can.